DIE Sabbati, 4 die Novembris. 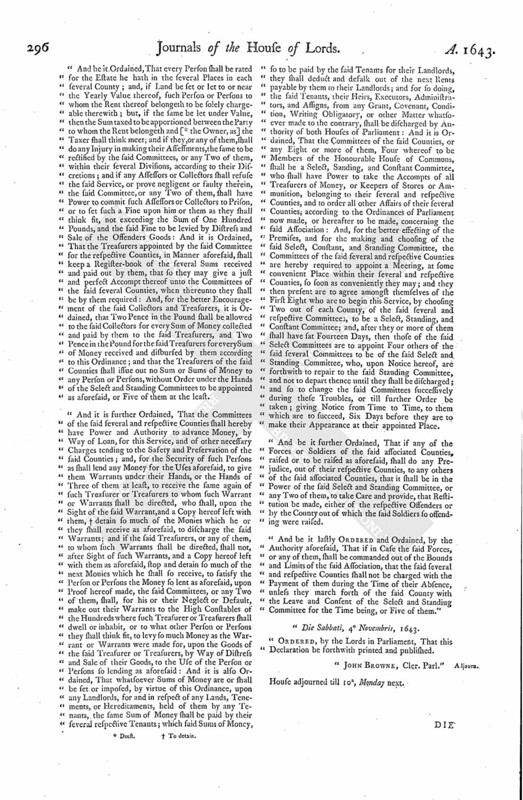 Sandeforth's Petition, committed for Words against the L. General. Captain Drinkwater, for searching the E. of Lincoln's Servants, sent for. Ordinance for associating Kent, Sossex, Surrey, and Hampshire. Upon reading the Petition of Edward Sandeforth, committed by this House to the Prison of Bridewell, for speaking Words against the Lord General, being heartily sorry for his Offence, and desiring to be released; this House Ordered, That this House refers him to the Lord General, to do therein as he shall find Cause. Ordered, That Captain Drinkewater, that searched the Servant of the Earl of Lyncolne on Thursday last, shall be sent for, to attend this House on Monday Morning, concerning that Business. (fn. 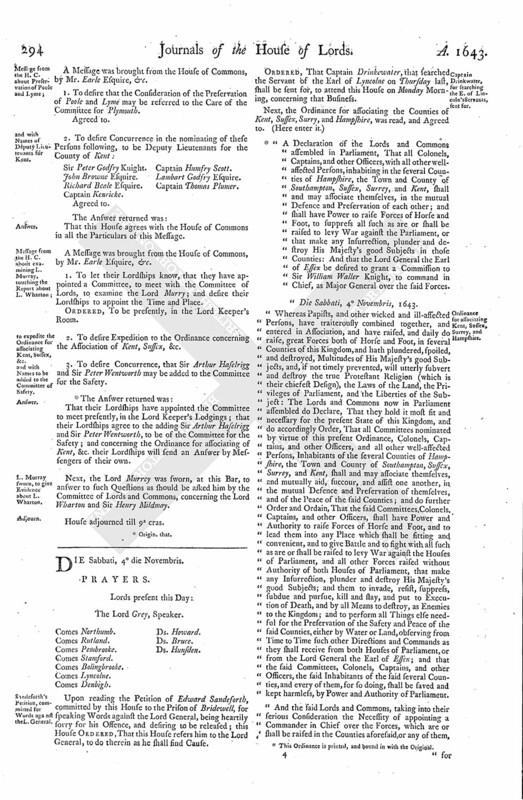 1) "A Declaration of the Lords and Commons assembled in Parliament, That all Colonels, Captains, and other Officers, with all other wellaffected Persons, inhabiting in the several Counties of Hampshire, the Town and County of Southampton, Sussex, Surrey, and Kent, shall and may associate themselves, in the mutual Defence and Preservation of each other; and shall have Power to raise Forces of Horse and Foot, to suppress all such as are or shall be raised to levy War against the Parliament, or that make any Insurrection, plunder and destroy His Majesty's good Subjects in those Counties: And that the Lord General the Earl of Essex be desired to grant a Commission to Sir William Waller Knight, to command in Chief, as Major General over the said Forces. "Die Sabbati, 4 Novembris, 1643. "Whereas Papists, and other wicked and ill-affected Persons, have traiterously combined together, and entered in Association, and have raised, and daily do raise, great Forces both of Horse and Foot, in several Counties of this Kingdom, and hath plundered, spoiled, and destroyed, Multitudes of His Majesty's good Subjects, and, if not timely prevented, will utterly subvert and destroy the true Protestant Religion (which is their chiefest Design), the Laws of the Land, the Privileges of Parliament, and the Liberties of the Subject: The Lords and Commons now in Parliament assembled do Declare, That they hold it most fit and necessary for the present State of this Kingdom, and do accordingly Order, That all Committees nominated by virtue of this present Ordinance, Colonels, Captains, and other Officers, and all other well-affected Persons, Inhabitants of the several Counties of Hampshire, the Town and County of Southampton, Sussex, Surrey, and Kent, shall and may associate themselves, and mutually aid, succour, and assist one another, in the mutual Defence and Preservation of themselves, and of the Peace of the said Counties; and do further Order and Ordain, That the said Committees, Colonels, Captains, and other Officers, shall have Power and Authority to raise Forces of Horse and Foot, and to lead them into any Place which shall be fitting and convenient, and to give Battle and to fight with all such as are or shall be raised to levy War against the Houses of Parliament, and all other Forces raised without Authority of both Houses of Parliament, that make any Insurrection, plunder and destroy His Majesty's good Subjects; and them to invade, resist, suppress, subdue and pursue, kill and slay, and put to Execution of Death, and by all Means to destroy, as Enemies to the Kingdom; and to perform all Things else needful for the Preservation of the Safety and Peace of the said Counties, either by Water or Land, observing from Time to Time such other Directions and Commands as they shall receive from both Houses of Parliament, or from the Lord General the Earl of Essex; and that the said Committees, Colonels, Captains, and other Officers, the said Inhabitants of the said several Counties, and every of them, for so doing, shall be saved and kept harmless, by Power and Authority of Parliament. "And the said Lords and Commons, taking into their serious Consideration the Necessity of appointing a Commander in Chief over the Forces, which are or shall be raised in the Counties aforesaid, or any of them, for the Service aforesaid, do Order and Ordain, That the Lord General the Earl of Essex, shall be desired to grant a Commission to Sir William Waller Knight, to command in Chief, as Major General of all the Forces raised, or to be raised, in the said Counties; and to have Power to lead, conduct, and carry the same, to such Places as he shall think fit, for the Defence of the said Counties; and likewise Power to give the same Orders and Instructions, in his Excellency's Absence, for regulating the Solders which are or shall be under his Command, as his said Excellence hath given to his Army, and to use Martial Law, to compel Obedience thereunto, as Occasion shall require; and also Power and Authority to make and appoint Colonels, Captains, and other Officers, for levying, conducting, and leading the said Forces, as he shall think fit: And further to enable them to maintain and pay the Forces of Horse and Foot, now raised, or hereafter to be raised, by them, that there shall be rated, taxed, and levied, upon the said several and respective Counties and Places, by the respective Committees of the same nominated by virtue of this Ordinance, so much Money as the Select and Standing Committees appointed by this Ordinance, to be chosen out of the respective Committees of the said Counties, shall hold fit and requisite (Weekly to be Collected, or otherwise), within the several Limits and Hundreds of the said Counties and Places; the First Payment of the said Weekly Sums so assessed by this Ordinance to be made at or before the First Day of November, in the Year of our Lord God 1643. "For the County of Hampshire, and the Town and County of Southampton; Sir William Lewis Baronet, Sir William Uvedal Knight, Sir Thomas Jervoise Knight, Robert Wallop, Richard Whitehead, Richard Norton, John Doddington, Richard Jervoise, John Liste, Thomas Clerke, John Button, Edward Hooper, John Bulkley, Jo. Kempe, Richard Major, John Hook, John S. Barbe, Arthur Broomefeild, Edward Doddington, John Feilder, Henry Campion, William Wither, Nicholas Love, Thomas Chandeler, James Tutt, Richard Moore, William Carrich, William Collins, Francis Rivett, Thomas Bettsworth of Childen, Tho. Creswel of Heckfeild, Rob. Knapton, John Pittman, Thomas Evans, Thomas Hanbury, Henry Broomefeild Esquires, Thomas Gale, Thomas Dowse of Elden, Richard Love of Basinge, William Goore, Robert Hawood of Sutton, Alexander Willson, William Woulger, Tho. Mason Mayor of Southampton, Alderman Gallop, Alderman Exon, Gentlemen. 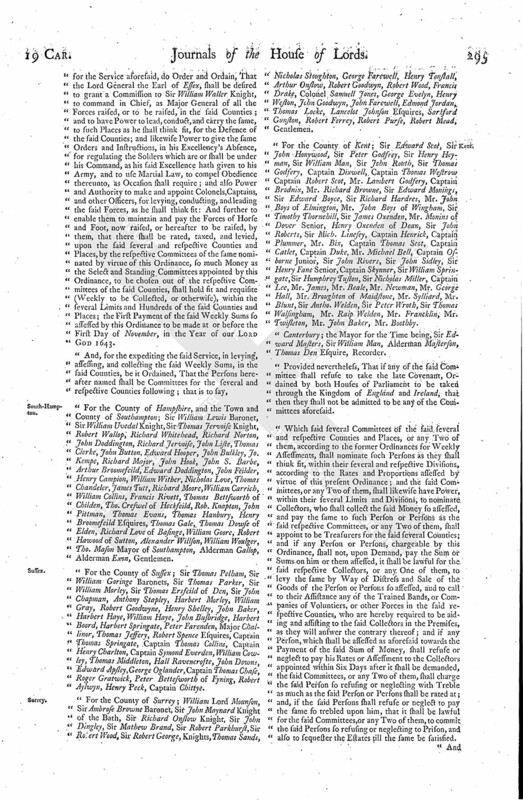 "For the County of Sussex; Sir Thomas Pelham, Sir William Goringe Baronets, Sir Thomas Parker, Sir William Morley, Sir Thomas Ersfeild of Den, Sir John Chapman, Anthony Stapley, Harbert Morley, William Gray, Robert Goodwyne, Henry Shelley, John Baker, Harbert Haye, William Haye, John Busbridge, Harbert Boord, Harbert Springate, Peter Farenden, Major Challinor, Thomas Jeffery, Robert Spence Esquires, Captain Thomas Springate, Captain Thomas Collins, Captain Henry Charlton, Captain Symond Everden, William Cowley, Thomas Middleton, Hall Ravencrofte, John Downs, Edward Apsley, George Oglander, Captain Thomas Chase, Roger Gratwick, Peter Bettesworth of Fyning, Robert Aylwyn, Henry Peck, Captain Chittye. "For the County of Surrey; William Lord Mounson, Sir Ambrose Browne Baronet, Sir John Maynard Knight of the Bath, Sir Richard Onslow Knight, Sir John Dingley, Sir Mathew Brand, Sir Robert Parkhurst, Sir Robert Wood, Sir Robert George, Knights, Thomas Sands, Nicholas Stoughton, George Farewell, Henry Tonstall, Arthur Onslow, Robert Goodwyn, Robert Wood, Francis Drake, Colonel Samuell Jones, George Evelyn, Henry Weston, John Goodwyn, John Farewell, Edmond Jordan, Thomas Locke, Lancelot Johnson Esquires, Sarkford Gunston, Robert Ferrey, Robert Purse, Robert Mead, Gentlemen. "For the County of Kent; Sir Edward Scot, Sir John Honywood, Sir Peter Godfrey, Sir Henry Heyman, Sir William Man, Sir John Routh, Sir Thomas Godfery, Captain Dixwell, Captain Thomas Westrow Captain Robert Scot, Mr. Lambert Godfery, Captain Brodnix, Mr. Richard Browne, Sir Edward Monings, Sir Edward Boyce, Sir Richard Hardres, Mr. John Boys of Elmington, Mr. John Boys of Wingham, Sir Timothy Thornehill, Sir James Oxenden, Mr. Monins of Dover Senior, Henry Oxenden of Dean, Sir John Roberts, Sir Mich. Linesey, Captain Henrick, Captain Plummer, Mr. Bix, Captain Thomas Scot, Captain Catlet, Captain Duke, Mr. Michael Bell, Captain Osborne Junior, Sir John Rivers, Sir John Sidley, Sir Henry Fane Senior, Captain Skynner, Sir William Springate, Sir Humphrey Tuston, Sir Nicholas Miller, Captain Lee, Mr. James, Mr. Beale, Mr. Newman, Mr. George Hall, Mr. Broughton of Maidstone, Mr. Sylliard, Mr. Blunt, Sir Antho. Welden, Sir Peter Wroth, Sir Thomas Walsingham, Mr. Ralp Welden, Mr. Francklin, Mr. Twisleton, Mr. John Baker, Mr. Boothby. "Canterbury; the Mayor for the Time being, Sir Edward Masters, Sir William Man, Alderman Masterson, Thomas Den Esquire, Recorder. Provided nevertheless, That if any of the said Committee shall refuse to take the late Covenant, Ordained by both Houses of Parliament to be taken through the Kingdom of England and Ireland, that then they shall not be admitted to be any of the Committees aforesaid. "Which said several Committees of the said several and respective Counties and Places, or any Two of them, according to the former Ordinances for Weekly Assessments, shall nominate such Persons as they shall think fit, within their several and respective Divisions, according to the Rates and Proportions assessed by virtue of this present Ordinance; and the said Committees, or any Two of them, shall likewise have Power, within their several Limits and Divisions, to nominate Collectors, who shall collect the said Money so assessed, and pay the same to such Person or Persons as the said respective Committees, or any Two of them, shall appoint to be Treasurers for the said several Counties; and if any Person or Persons, chargeable by this Ordinance, shall not, upon Demand, pay the Sum or Sums on him or them assessed, it shall be lawful for the said respective Collectors, or any One of them, to levy the same by Way of Distress and Sale of the Goods of the Person or Persons so assessed, and to call to their Assistance any of the Trained Bands, or Companies of Voluntiers, or other Forces in the said respective Counties, who are hereby required to be aiding and assisting to the said Collectors in the Premises, as they will answer the contrary thereof; and if any Person, which shall be assessed as aforesaid towards the Payment of the said Sum of Money, shall refuse or neglect to pay his Rates or Assessment to the Collectors appointed within Six Days after it shall be demanded, the said Committees, or any Two of them, shall charge the said Person so refusing or neglecting with Treble as much as the said Person or Persons shall be rated at; and, if the said Persons shall refuse or neglect to pay the same so trebled upon him, that it shall be lawful for the said Committees, or any Two of them, to commit the said Persons so refusing or neglecting to Prison, and also to sequester the Estates till the same be satisfied. And be it Ordained, That every Person shall be rated for the Estate he hath in the several Places in each several County; and, if Land be set or let to or near the Yearly Value thereof, such Person or Persons to whom the Rent thereof belongeth to be solely chargeable therewith; but, if the same be let under Value, then the Sum taxed to be apportioned between the Party to whom the Rent belongeth and [ (fn. 2) the Owner, as] the Taxer shall think meet; and if they, or any of them, shall do any Injury in making their Assessments, the same to be rectified by the said Committees, or any Two of them, within their several Divisions, according to their Discretions; and if any Assessors or Collectors shall refuse the said Service, or prove negligent or faulty therein, the said Committee, or any Two of them, shall have Power to commit such Assessors or Collectors to Prison, or to set such a Fine upon him or them as they shall think fit, not exceeding the Sum of One Hundred Pounds, and the said Fine to be levied by Distress and Sale of the Offenders Goods: And it is Ordained, That the Treasurers appointed by the said Committee for the respective Counties, in Manner aforesaid, shall keep a Register-book of the several Sums received and paid out by them, that so they may give a just and perfect Accompt thereof unto the Committees of the said several Counties, when thereunto they shall be by them required: And, for the better Encouragement of the said Collectors and Treasurers, it is Ordained, that Two Pence in the Pound shall be allowed to the said Collectors for every Sum of Money collected and paid by them to the said Treasurers, and Two Pence in the Pound for the said Treasurers for every Sum of Money received and disbursed by them according to this Ordinance; and that the Treasurers of the said Counties shall issue out no Sum or Sums of Money to any Person or Persons, without Order under the Hands of the Select and Standing Committees to be appointed as aforesaid, or Five of them at the least. "And it is further Ordained, That the Committees of the said several and respective Counties shall hereby have Power and Authority to advance Money, by Way of Loan, for this Service, and of other necessary Charges tending to the Safety and Preservation of the said Counties; and, for the Security of such Persons as shall lend any Money for the Uses aforesaid, to give them Warrants under their Hands, or the Hands of Three of them at least, to receive the same again of such Treasurer or Treasurers to whom such Warrant or Warrants shall be directed, who shall, upon the Sight of the said Warrant, and a Copy hereof left with them, (fn. 3) detain so much of the Monies which he or they shall receive as aforesaid, to discharge the said Warrants; and if the said Treasurers, or any of them, to whom such Warrants shall be directed, shall not, after Sight of such Warrants, and a Copy hereof left with them as aforesaid, stop and detain so much of the next Monies which he shall so receive, to satisfy the Person or Persons the Money so lent as aforesaid, upon Proof hereof made, the said Committees, or any Two of them, shall, for his or their Neglect or Default, make out their Warrants to the High Constables of the Hundreds where such Treasurer or Treasurers shall dwell or inhabit, or to what other Person or Persons they shall think fit, to levy so much Money as the Warrant or Warrants were made for, upon the Goods of the said Treasurer or Treasurers, by Way of Distress and Sale of their Goods, to the Use of the Person or Persons so lending as aforesaid: And it is also Ordained, That whatsoever Sums of Money are or shall be set or imposed, by virtue of this Ordinance, upon any Landlords, for and in respect of any Lands, Tenements, or Hereditaments, held of them by any Tenants, the same Sum of Money shall be paid by their several respective Tenants; which said Sums of Money, so to be paid by the said Tenants for their Landlords, they shall deduct and defalk out of the next Rents payable by them to their Landlords; and for so doing, the said Tenants, their Heirs, Executors, Administrators, and Assigns, from any Grant, Covenant, Condition, Writing Obligatory, or other Matter whatsoever made to the contrary, shall be discharged by Authority of both Houses of Parliament: And it is Ordained, That the Committees of the said Counties, or any Eight or more of them, Four whereof to be Members of the Honourable House of Commons, shall be a Select, Sanding, and Constant Committee, who shall have Power to take the Accompts of all Treasurers of Money, or Keepers of Stores or Ammunition, belonging to their several and respective Counties, and to order all other Affairs of their several Counties, according to the Ordinances of Parliament now made, or hereafter to be made, concerning the said Association: And, for the better effecting of the Premises, and for the making and choosing of the said Select, Constant, and Standing Committee, the Committees of the said several and respective Counties are hereby required to appoint a Meeting, at some convenient Place within their several and respective Counties, so soon as conveniently they may; and they then present are to agree amongst themselves of the First Eight who are to begin this Service, by choosing Two out of each County, of the said several and respective Committees, to be a Select, Standing, and Constant Committee; and, after they or more of them shall have sat Fourteen Days, then those of the said Select Committees are to appoint Four others of the said several Committees to be of the said Select and Standing Committee, who, upon Notice hereof, are forthwith to repair to the said Standing Committee, and not to depart thence until they shall be discharged; and so to change the said Committees successively during these Troubles, or till further Order be taken; giving Notice from Time to Time, to them which are to succeed, Six Days before they are to make their Appearance at their appointed Place. "And be it further Ordained, That if any of the Forces or Soldiers of the said associated Counties, raised or to be raised as aforesaid, shall do any Prejudice, out of their respective Counties, to any others of the said associated Counties, that it shall be in the Power of the said Select and Standing Committee, or any Two of them, to take Care and provide, that Restitution be made, either of the respective Offenders or by the County out of which the said Soldiers so offending were raised. "And be it lastly Ordered and Ordained, by the Authority aforesaid, That if in Case the said Forces, or any of them, shall be commanded out of the Bounds and Limits of the said Association, that the said several and respective Counties shall not be charged with the Payment of them during the Time of their Absence, unless they march forth of the said County with the Leave and Consent of the Select and Standing Committee for the Time being, or Five of them." "Ordered, by the Lords in Parliament, That this Declaration be forthwith printed and published. House adjourned till 10a, Monday next. 1. This Ordinance is printed, and bound in with the Original.